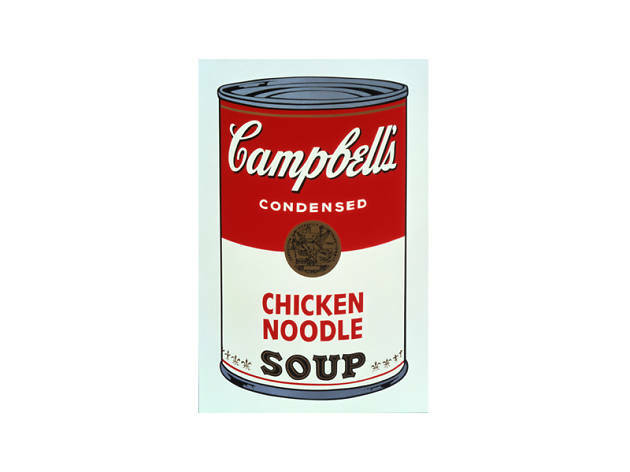 "Campbell's Soup I: Chicken Noodle, 1968" © 2015 The Andy Warhol Foundation for the Visual Arts, Inc.
Andy Warhol wanted to make art that sells. While Pollock wannabes were contemplating the nature of “serious” art, Warhol was graduating from college and taking the commercial path to become an illustrator at Glamour. His first assignment as an illustrator was to depict the words “Success is a Job in New York,” words which incidentally turned out to be just his fate. He generated art for the masses and in doing so, produced works both visually pleasing and conceptually easy to swallow. “Andy Warhol Live” includes his most celebrated and well-known pieces as well as his illustrations from the ’50s and pictures from his childhood. 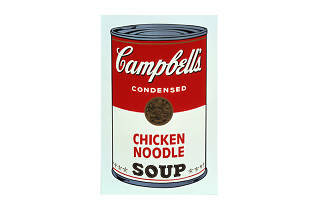 Although highlights will include his portraits of Marilyn Monroe, the beloved “Campbell's Soup Cans” might be the most anticipated among them all. Did you know that each soup can is a different flavor, portraying varying lighting conditions? Using silkscreen as the primary medium, the artist simplifies and flattens images from pop culture, and tweaks the chroma wheel up high to represent a different reality. Taken from the private collection of The Andy Warhol Foundation in Pittsburgh, there are approximately 400 works on display. Recovered for the first time in 2014 after 30 years, his digital works are a refreshing treat, and so are his early experimental films. Here’s to a brand new side of Warhol, opening live at DDP.